Since 2010, the IEEE celebrates its own IEEE Day in October. This year the celebration day is on October 6th 2011. So this week we planned, arranged, and carried out the event titled IEEE Day Lectures on LTE Development. The organisers are the IEEE Indonesia Section and the IEEE Comsoc Indonesia Chapter, supported by IEEE Student Branch University of Indonesia and IEEE Student Branch Telkom Institute of Technology. The venue was at @America. 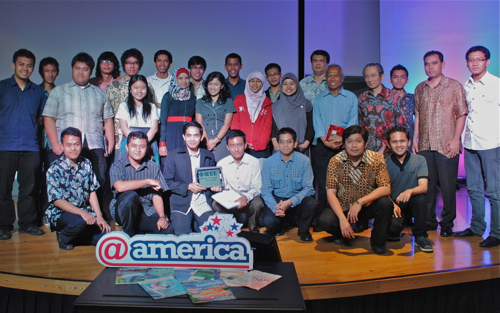 @America is a public room owned and managed by the US Embassy in Jakarta. Located in a business centre just in the centre of Jakarta, it is a high-technology cultural centre where people can explore, experience, and express their interests in fresh and exciting ways. In its physical and virtual spaces, the visitors can experience cool and cutting-edge technology, interactive games, and live events designed to generate interest and create communities. Since my chairmanship at Comsoc Chapter, we have carried out a series of lectures, seminars, and technical meetings discussing the aspects of 4G Mobile Networks. This year, some network providers have started to implement some of the technologies discussed. 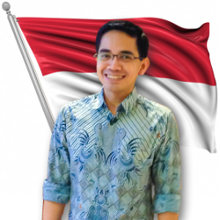 The IEEE Day Lectures was to open the discussion of current implementation of technologies related to 4G Mobile in Indonesia. It would start a series of discussion about many aspects, including the LTE Deployement, WiMAX positioning, IPTV implementation over 4G, cognitive radio, policies on spectrum, context-aware applications, etc. The attendance number is about 50. Attendees include those who come from universities, government, operators, consultants, and other parties who have interests in LTE and its implementation. Thank you for @America, for the IEEE volunteers, the attendees, and the speakers. We have celebrate the IEEE Day quite successfully!